Italiano Semplicemente è un sito in cui apprendere l’italiano utilizzando il metodo TPRS e le sette regole d’Oro. Teaching Proficiency through Reading and Storytelling is a great method for learning languages. 1. Read the text in Italian and English. – the more you repeat the more familiar it gets!! 4. If you feel comfortable, go on and listen to the Question and Answer mp3 file. 5. Read and listen a few times my questions and answers. – Reading the Italian version along with me or repeating after me – is just fine! 9. 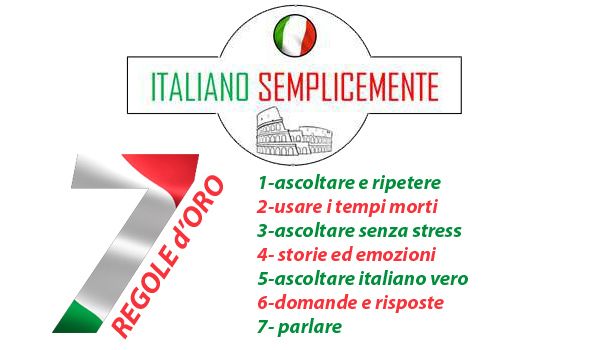 Be sure to follow the seven gold rules di Italiano Semplicemente for a better and productive learning experience. The second point is the difficult part. If you just try to speak, you will make many mistakes, for example mispronounce the words or use a wrong word order. And if you don’t realize those mistakes they will stick in your mind and it will be very difficult to get rid of them. So please try to avoid that! With my audio lessons you will listen a lot of easy and clear spoken Italian and you will speak it as well. The question and answer part is the secret. This special technique will enable you to speak Italian without making the above mentioned mistakes. The Italian language audio lessons have everything you need to learn to speak Italian in a natural way. Without learning boring grammar rules and vocabulary lists by heart. Wide variety of TPRS materials and readers; free downloads, including free sample materials, classroom aids, lesson plans and planning outlines and teaching tools & tips; workshop schedules; workshop and presentation handouts; 101 helpful links.